The UK energy ombudsman, Ombudsman Services, has published its annual report 2017. While energy-related complaints to the ombudsman remained relatively stable with only a slight increase (from 88,255 in 2016 to 88,423 in 2017), the number of complaints resolved increased to 48,737 (from 41,622 the year before). In 2017, switching replaced back-billing as the hot topic in the energy sector. Ombudsman Services was involved in setting up the “Energy Guarantee Switch”, a voluntary code of practice aimed at encouraging best practice and consumer confidence beyond the regulatory requirements on switching. Another major issue in 2017 was incorrect calorific value information entered into billing systems by several suppliers. Ombudsman Services helped the suppliers correct their mistake and determine a fair award for all affected customers, without the need for any formal action. 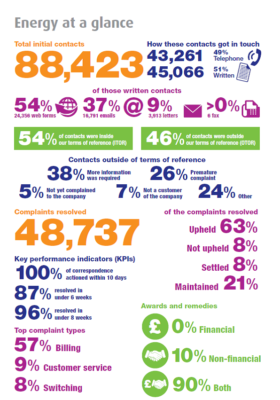 Finally, 2017 was the first full year of Ombudsman Services working with Ofgem and Citizens Advice as a tripartite group, aiming at better addressing causes of complaints and benefiting all consumers, independently of whether they have complained or not. The full reports can be downloaded from the website of Ombudsman Services.